Three girls compete with each other for the right to be a queen, but everything will be clear at the incoming event. Each girl thinks, she is the best. See who is actually better, playing for every girl. The thronecoming challenge is something every beautiful girl should try out. 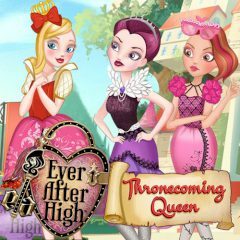 Why don't you help one of Ever After girls to get the crown and overcome other competitors. Read the rules and what you should do, then do it better that your competitors and put on the crown on your head!